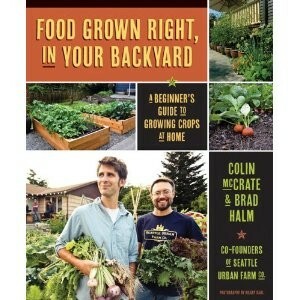 Food Grown Right In Your Backyard : A Beginner's Guide to Growing Crops at Home by Colin Mc Crate and Brad Halm is the next step for people who've started on the path to a more self-sufficient lifestyle and want more information on growing food at home. It's written for beginners and has detailed information about how to grow vegetables, berries and some fruits. It's written for the serious beginner who really wants to learn a lot more. Rather than being about how to maximize growing area, this is more about how to grow food. It starts from the very basics, choosing the place and size for your garden, figuring out which areas get the most sun and how much space you have to work in and how best to work in that space, containers, or a simple raised bed. Then it goes into soil, explaining how to test soil, and how to add things to it to make a better growing medium. In depth information about different compost types and how to maintain compost are helpful for people who want to start composting. They also talk about where organic fertilizers can be helpful. There is also a lot of detail about irrigation, crop rotation and climate. They explain how to use row covers, build trellises and other structures for things that need support. Then it gets into the types of plants that people are most likely to grow with lots of information about how to grow them, the various troubles that particular plant can have and how best to harvest it. Lots of detail helps you decide what you're willing to do and what you might not want to start yet because of the time investment. There is also a wonderful chapter on troubleshooting. I really recommend this for people looking to step up their home food gardening. Published by Skipstone Publishing. Check out their site for some free downloads.